Researchers from Harvard University have begun efforts to clone human embryos, defying hopes by President George W Bush for a US ban. The scientists say they hope to harvest stem cells to try to fight blood diseases like leukaemia and diabetes. The Bush administration has banned the use of government money to support human cloning research. But the world's richest university decided, after two years of vetting, to support and fund its project privately. It is thought Harvard wants to become a world leader in the field. Next year it is due to begin building a science complex that will house the Harvard Stem Cell Institute. Stem cell research is controversial, however. Pro-life campaigners argue that the process, which involves disposing of the used embryo, amounts to taking a human life. The science is also uncertain. South Korea's reputation as a world leader was badly damaged recently after its top scientist admitted faking results. He has since been charged with fraud. Harvard University President Lawrence Summers said the potential benefits of the programme outweighed such concerns. "While we understand and respect the sincerely held beliefs of those who oppose this research, we are equally sincere in our belief that the life-and-death medical needs of countless suffering children and adults justifies moving forward with this research," he said in a statement. 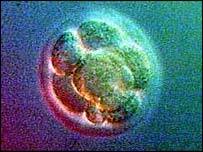 The scientists aim is to remove nuclei from human egg cells, and replace them with the DNA of a sick patient. Stem cells can then be grown that match identically those in the patient. When they are introduced to the patient's body, they should not, therefore, be rejected. "Our long-term goal is to create embryonic stem cells from a patient's tissues, correct the genetic defects, and get the repaired cells back into the patients," said Dr George Daley, one of the leaders of the project at Boston Children's Hospital. The university, which is the richest in the world, with an endowment worth up to $27bn (£14bn), says it will rely on funds from private donors for the research. As well as blocking federal funding, the US president said in his state of the union speech in January that legislation would be drawn up to prevent "the most egregious abuses of medical research - human cloning in all its forms".